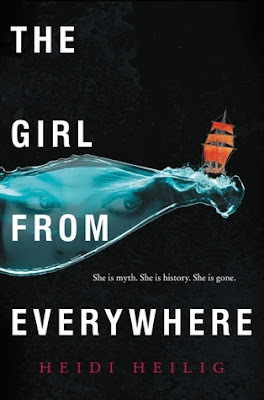 Heidi Heilig whispered sweet nothings in my ear when she choose the unique combo of history, maps and time travel for her novel The Girl from Everywhere. I was completely entranced with the concept and even more so with the story itself. I loved the characters. They were all unique and interesting, which made me want to know more about them. The crew has been collected from various locations and points of time in history. Some not even on places that exist outside a believers map. We get tidbits of their side stories but I would have been happy to have their whole histories laid out. I found that I loved them all. I don’t feel like the romance was the focus but I adored Kashmir so much that I was completely bothered by Blake. As in when Nix was hanging out with him I didn’t want to read those parts. I think the way Nix explains some things later in the book makes things make sense to me but still. Team Kash all the way. Nix relationship with her father Slate and the ghost of her mother was what the main focus of the book is really about. It’s that idea of why chase what’s gone when you have something wonderful in front of you. Their ups and downs is what really kept me intrigued in the story. There were moments when I hated Slate and moments when I wanted to yell at Nix. I truly loved watching their relationship evolve as they seemed to be heading towards separation. Like I said yay for history. I was actually recently reading (or watching I don’t know) about them unearthing the Terracotta Army. So I thought it was such a cool addition to the story. Plus all the Hawaiian history that you don’t get to hear about that often. I loved the Night Marchers. I did love this plot. It felt like we were following a string through time that finally leads to the ball of yarn. Ya weird analogy I know. It kept me interested and wondering where they would go next. I really enjoyed the book and I look forward to more from Heidi Heilig. This one sounds so good! I'm glad to see you enjoyed it.